The founder and chair María Bravo brought together personalities from the world of theater, music, sports and philanthropy at a gala filled with excitement that was celebrated at the Thyssen-Bornemisza National Museum in Madrid. The singer Anastacia, honorary chair, and the Global Gifter Pamela Anderson shined with María Bravo during this evening full of solidarity. 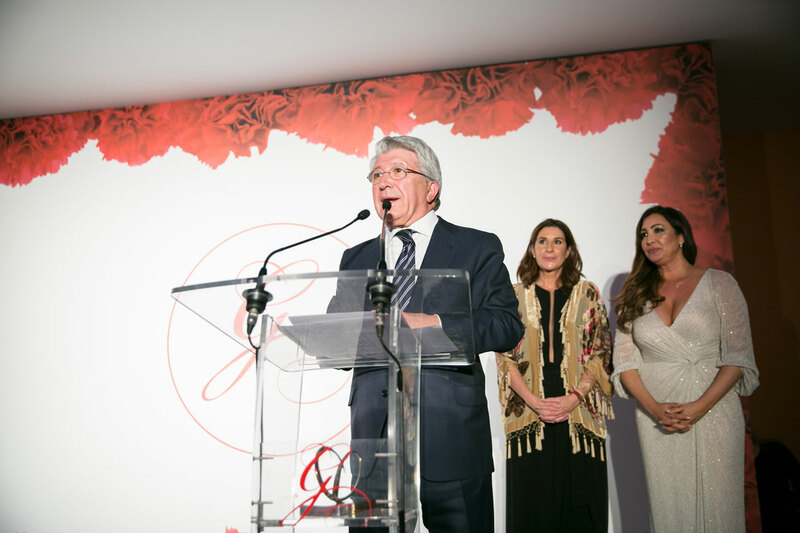 Enrique Cerezo, on behalf of the Atlético de Madrid Foundation, and the motivational coach Montse Hidalgo collected the Global Gift Humanitarian Award, which recognizes their social work. Funds raised from the gala will go to the charitable projects of Fundación Querer, Thyssen-Bornemisza National Museum and the Global Gift Foundation. For the second year in a row, two-Michelin-star chef Ramón Freixa collaborated and opened his kitchen to the charitable causes, creating the menu enjoyed by more than 200 guests. The event was attended by well-known faces such as Borja Thyssen, Blanca Cuesta, Chenoa, Margarita Vargas, Luis Alfonso de Borbón, Simoneta Gómez Acebo, Esmeralda Moya, Raúl Olivo, Rosa de España, Ana Rosa Quintana, Esther Doña and Carlos Falcó, Father Ángel, Patricia Gómez-Toledo, Guillermo Solana, Fiona Ferrer, Adil Rami, among others. Performances on the night included Rafael Amargo, Jorge Blass, Descemer Bueno, Angelica de la Riva and Rosa Torres Pardo. During the III ‘The Global Gift Gala’, which was presented by the actress Norma Ruíz, the Foundation presented the Global Gift awards, awards that defend the social commitment of personalities and entities with disadvantaged groups. The Atlético Madrid Foundation received ‘The Global Gift Humanitarian Award’ for its social work and its commitment to society, developing all kinds of activities for cultural and educational purposes. The Atlético Madrid Foundation works in its day to day to promote and instill the fundamental values ​​of sport in society, as a tool in the education of people, especially children and adolescents, thus contributing to their complete personal, physical and social development. “It is a real honor and a great satisfaction to receive this wonderful award. Atletico Madrid as a club, as everyone knows, has been committed to all the projects promoted by its Foundation for many years” said Enrique Cerezo, president of the Atlético Madrid club. The world of football was also represented by the French footballer Adil Rami, former player of Valencia and Sevilla. With the same award, motivational coach Montse Hidalgo was awarded in recognition of her professional career dedicated to changing the personal and professional lives of hundreds of people through the empowerment of men and women around the world. For Montse Hidalgo “it is a real honor to receive this award that recognizes the work we do at the University of Happiness.” Some of the Global Gifters awarded with this award in other editions of ‘The Global Gift Gala’ have been: David Beckham, Karen Ruimy, Vicente del Bosque, Mariah Carey or Father Angel among others. For the second year in a row, two-Michelin-star chef Ramón Freixa wanted to contribute his bit to the causes supported by the Global Gift Foundation by preparing the Gala menu. With a marked Spanish accent in its creation and faithful to its essence, Ramón Freixa, once again bet on the best seasonal products. Ramón Freixa commented that he is “very committed to the Global Gift Foundation and it is an honor to share again my gastronomic proposal at the service of this wonderful solidary project that, without a doubt, will help improve the lives of many people and especially children”. A long list of important personalities of the Spanish and international cultures such as Borja Thyssen, Blanca Cuesta, Pamela Anderson, Chenoa, Margarita Vargas, Luis Alfonso de Borbón, Esher Doña and Carlos Falcó, Rosa and Natalia from Operación Triunfo I, Simoneta Gómez Acebo, Esmeralda Moya , Cecilia Gómez, Cristina Castaño, Father Ángel, Raúl Olivo or Fiona Ferrer, supported this third edition of ‘The Global Gift Gala’, which featured performances by artists such as the dancer Rafael Amargo, the illusionist Jorge Blass, the singer Descemer Bueno with the singer Dama, the tenor Angélica de la Riva, who was accompanied during her performance by the National Music Award 2018 winner, pianist, Rosa Torres Pardo. Communication is a key element to spread the solidarity work, and for that reason, for the first time, and it was for this reason the organization invited two very special reporters to be on their red carpet. Laura of twelve years and Gonzalo of eleven were the official reporters for XL Kids, who told everything that happened through the educational station of the Gestiona Group, Que! XLKids, the only radio made by and for children. In this magical and emotional evening, care for childhood has once again played a leading role. 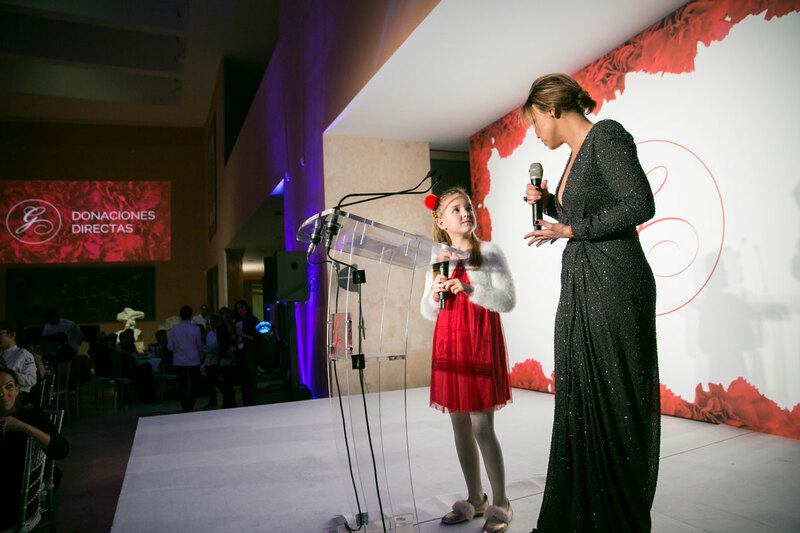 One of the most special moments of the night came from the hand of Chenoa and little Paula, who read her own story, that of a girl who suffers from cystic fibrosis and that benefits from Casa Global Gift, her second home. During the traditional charity auction, Paula and Chenoa explained to the attendees how she uses vest that makes life easier, helping her to breathe. Together with the singer, they lifted donations to cover the cost of 7 vests for children in a similar situation to Paula. In addition, another of the direct donations that were made during the Gala was intended to finance the construction of a copper-coated room for children with cystic fibrosis. 16,000 euros were obtained to start one of these rooms, of which there are currently only 12 in the world, allowing greater hygiene and health conditions for this type of patients. Likewise, in order to help and improve the mobility of children with chronic neurological diseases, those attending the gala made donations to build two climbing walls in El Cole de Celia and Pepe, the solidary project of the Querer Foundation.